As part of Watch Me Move – On the Big Screen, a special animation season that runs throughout July and August and complements Watch Me Move – The Animation Show in Barbican Art Gallery, the Barbican explores the work of some of the most influential filmmakers in animation, starting with Jan Švankmajer from Thursday 16 to Saturday 25 June. The screening of Alice, a wonderfully sinister interpretation of Lewis Carroll’s story, on Thursday 16 will be followed by a Q&A with Jan Švankmajer and Peter Hames. The director’s latest film, Surviving Life (Theory and Practice) (2010), a comic, surreal take on psychoanalysis, screens on Sunday 19. 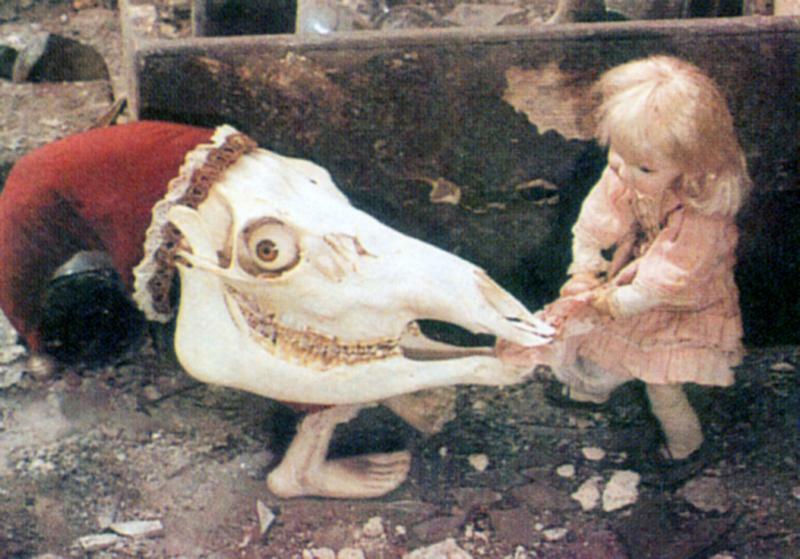 Mark Stafford and Virginie Sélavy interviewed Jan Švankmajer by email. Q; You have said you were ‘steeped’ in Prague and yet the city rarely features in your films. In what way has Prague, and being Czech, influenced your work? Being Czech definitely didn’t have any influence on my work. What did influence it was that I spent my childhood in Czechoslovakia, particularly in Prague. A personality is formed by its mental morphology. For artistic work this is absolutely fundamental. Prague appears in my films quite often. You will find it in Alice and in Surviving Life (Theory and Practice), but this is not the Prague of the tourist guide books, but the Prague of my childhood. You won’t find ‘the sights’ but chipped walls, the dirty staircases of blocks of flats, mysterious cellars, hidden courtyards, the suburbs. Q: Is it true that you had a little puppet theatre at home as a child and that this was common in all Czech families? How important has this been for your work? Yes, it was quite a common toy. For an introverted child it was an amazing gift. I could use puppets to play out all life’s injustices, correcting them, taking revenge. Puppets have accompanied me throughout my life. It may be that everything I do is just a puppet play. Q: Alice was your first feature film, why did you choose to start with Lewis Carroll? How important is he as an influence on your work in general? Alice belongs to my mental morphology. Before I made up my mind to do a feature-length film I was circling around the subject. I made Jabberwocky and Down to the Cellar and only then dared to shoot the whole of Alice. Personally I think that Lewis Carroll’s Alice is one of the most important and amazing books produced by this civilisation. Q: Although it is not an adaptation, your Alice feels very close to the book, and in particular brings out the sense of menace and aggression that is present in it but is often overlooked in insipid versions such as Disney’s. Was that an important aspect of Carroll’s work for you? So far all adaptations of Alice (including the latest by Tim Burton) present it as a fairy tale, but Carroll wrote it as a dream. And between a dream and a fairy tale there is a fundamental difference. While a fairy tale has got an educational aspect – it works with the moral of the lifted forefinger (good overcomes evil), dream, as an expression of our unconscious, uncompromisingly pursues the realisation of our most secret wishes without considering rational and moral inhibitions, because it is driven by the principle of pleasure. My Alice is a realised dream. Q: Around the time of Alice, you said you were interested in a dialogue with your childhood. Do you still feel this way? Yes. Of course I wouldn’t cut myself off from the most important source of my work. Q: Do you feel animation can best represent the world of childhood, dream and imagination? Animation is, so far, the only way of breathing life into inanimate things. Children’s games work with the same magic. This kind of magic is the point where childhood and animation intersect with each other. Q: You have a clear interest in the materiality of the objects, in textures, shapes and surfaces and it is always wonderful to see how you bring to life very ordinary and often old, broken or discarded objects, which can become unfamiliar, menacing or amusing. Why are you particularly interested in that type of objects? I like things that have passed through human hands. Things that have been touched. Such things are charged with emotions that are capable of revealing themselves under certain, extremely sensitive circumstances. I collect such objects, surround myself with them and in the end I cast such ‘fetishes’ in my films. That’s also the reason why I don’t like computer animation. Virtual reality doesn’t have a tactile dimension. Objects and figures created on a computer have no past. Q: Did you feel there was a political aspect to Alice because of her rebellion against authority? An absurd court hearing with Alice (‘off with her head,’ shouted the Queen) obviously recalls the political trials of the 50s. Of course Alice, compared with the accused from that time, doesn’t respect the official script. It was just a minor analogy, I didn’t shoot the film because of that. But each imaginative work has got within itself, from its very essence, a subversive charge, because it knocks down the notion of lived-through reality as the only one possible. Q: In your latest film, Surviving Life, you tackle Freud, who has been a big influence on your work. The film makes a lot of play about the battle between Freud and Jung, and is not particularly respectful of either. How do you see Freud now and what is attitude to psychotherapy? I read a quote somewhere that a person can only really make fun of things he truly loves. It is the same with my psychoanalytical comedy Surviving Life. Psychoanalysis is for me in particular an amazing system of interpretation. I am not that much interested in practical therapy. Q: How much of the film’s imagery came from your own dreams? The whole film in fact originated on the basis of my dream. The beginning of the film (the first dream) is my authentic dream and then the dream about soldiers is a dream from my childhood. Q: How much of the film’s mischievous opening section (where you confess that Surviving Life is only an animation because you couldn’t afford live action) is true? It is true, although it didn’t turn out that way. My producer claims that we didn’t save anything; on the contrary, by using animation the shooting period became longer. But animation brought a new symbolic level into the film and thus enriched it imaginatively. Q: You have said that Surviving Life would be your last film but we have read that you are currently working on a project called Insects, is that true? I have pulled out of the drawer the film story of Insects, which I wrote in 1970, and which couldn’t have been made at that time – that’s why it finished in the drawer together with many other projects rejected by the censors. Some of which I have since completed: Food, Conspirators of Pleasures, Lunacy. Now we are going to try to do Insects. The story: amateur actors in a small town are rehearsing the play by the Capek brothers The Life of Insects and their destinies mingle with characters from the play. Q: You created work over 45 years under an oppressive regime. How does working under a capitalist system compare with working under a politically repressive system? That stupid censorship had, after all, one advantage: at least now I have a supply of stories and screenplays, although even nowadays it is not easy to make them. This utilitarian, profit-chasing civilisation, doesn’t need authentic work. The new iconographic art is now advertising and mass culture, because if advertising were to fail, civilisation would collapse, and mass culture is supposed to entertain the masses in their free time so that they don’t think about their poor lot and take to the streets. I don’t intend to do either. Q: There is a quote from you that we love: ‘Unless we again begin to tell fairy stories and ghost stories at night before going to sleep and recounting our dreams upon waking, nothing more is to be expected of our Western civilisation.’ This was written in 1987, what is your view on this now? I don’t have anything to change on this. Only the possibility that it might happen seems to me even more distant. In 1965 and 1967, Czechoslovakia won its first Hollywood Oscars – for A Shop on the High Street (Ján Kadár and Elmar Klos) and Closely Observed Trains (Jiří­ Menzel, 1966). In the same period, Miloš Forman’s A Blonde in Love (1965) and The Firemen’s Ball (1967) were also short-listed, and at Cannes in 1968 – before Godard and Truffaut closed the Festival – three Czech films were in competition. It was a golden era for Czech and Slovak cinema and, for a time, names such as Miloš Forman, Jiří­ Menzel, and Věra Chytilová were up there among the leading art-house directors. This change in the public face of one of the Eastern bloc’s most hard-line regimes was not deceptive. In 1968, the so-called ‘reform Communists’ took over and a new leader of the Communist Party was elected in the person of Alexander Dubček. ‘Socialism with a human face’ was the journalist’s description, yet the actual and proposed reforms went much wider – the rehabilitation of political prisoners, the curtailment of the powers of the secret police, the abolition of censorship, freedom of the press, the reintroduction of market mechanisms, the permitting of alternative political parties, the establishment of workers’ councils among them. In fact, to quote Dubček, ‘the widest possible democratisation of the whole socio-political system’. Without actually abdicating the ‘leading role of the Communist Party’, there was a genuine sense that Communism had taken the moral high ground – that the circle could be squared and that Communism and democracy could be combined. The ‘mistakes’ of the 1950s could be left behind, change was possible, and the dreams of a generation could be achieved. In retrospect, particularly in the light of the Soviet suppression of the Hungarian revolution in 1956, it seems inconceivable that anyone thought this would be allowed. The reforms did, after all, represent a threat to the whole system of bureaucratic rule established in the Eastern bloc. The West, since it had participated in the division of Europe at the Yalta Conference in 1945, would only shed crocodile tears if the experiment went wrong. Had the reformers succeeded, they really would have demonstrated that there were political alternatives to the fossilised models of East and West. Yet, when the Warsaw Pact armies invaded on August 21, it came as a profound shock and surprise. People defended the reforms, tried to explain the real situation to their perplexed invaders, and the Communist Party held its secret congress. But the government was kidnapped, taken to Moscow, and forced to sign an agreement legalising the occupation. Over the next year, the reformers were systematically removed from office and a government amenable to Moscow’s demands was instituted. According to one source, the Communist Party was purged of 70,000 members and many more resigned or were ‘removed’. Many, particularly intellectuals, emigrated – up to 80,000 in the autumn of 1968. Major filmmakers associated with the cinematic New Wave such as Forman, Ján Kadár and Ivan Passer, ended up in the USA, where they continued their careers. It is often argued that the Czech ‘New Wave’, which attracted so much attention in the 1960s, was essentially a non-political movement, that it only produced art films and comedies for a middle-class international audience. But this was far from the truth. Forman’s films such as A Blonde in Love and The Firemen’s Ball had put a reality on screen that was far from the sanitised and idealised world promoted by Socialist Realism. Also, during 1968, more directly political films had begun to appear, among them Vojtěch Jasný’s All My Good Countrymen and Jaromil Jireš’s The Joke. Jasný’s film, released in July, had first been written in 1956 but was only passed for production in 1967. The film focuses on the experiences undergone in a single Moravian village in the years 1945-57, together with an epilogue set in 1968. While it bluntly exposes the horrors and failures of agricultural collectivisation, its originality lies in the way in which it concentrates on a group of seven friends, whose lives and relationships become fragmented. The film is also a lyrical poem that asserts ‘the eternal course of Life and nature’ with some remarkable cinematography by Jaroslav Kučera (perhaps most famous for his work on Věra Chytilová’s more avant-garde Daisies). At the end of the film, a well-meaning Communist returns to the village and, with reference to the Prague Spring, indicates that everything is now changing. All of these films were, of course, part of an approved programme of production which continued on course both during and after the invasion. Curiously enough, The Joke was shooting its celebratory scenes about the arrival of Communism during the invasion itself. Based on the novel by Milan Kundera, which had been published the previous year, it is a tale of revenge in which past and present are intercut in an ongoing critical commentary. Its hero, Ludvik, once wrote ill-advised comments on a postcard to his militant girlfriend in the 1950s as a joke – ‘A healthy spirit reeks of idiocy. Long Live Trotsky!’ The result is two years forced labour, three in the army, and one in military prison. On his release, he determines to revenge himself on his former friend, Pavel, who had been instrumental in his condemnation. However, his plans to seduce Pavel’s wife are misplaced, since Pavel has now abandoned her and has also allied himself with the cause of reform. But this seems to be no more than a superficial change and, by the time of the film’s release in February 1969, the failure of the reform dream was apparent. 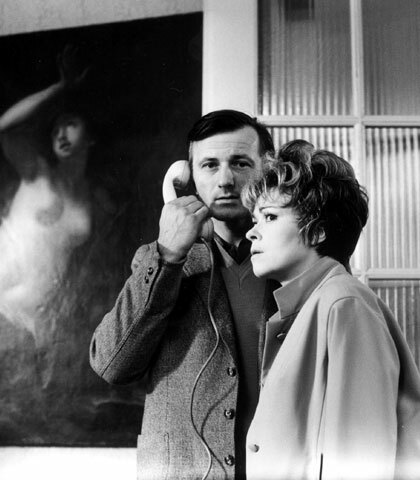 Other films shot during the invasion included Juraj Jakubisko’s The Deserter and the Nomads, a three-part film focusing on the First and Second World Wars, and ending with a post-nuclear allegory. During filming, the Soviet tanks rolled into shot. With Soviet tanks in the next street, Karel Kachyňa was also shooting his film The Ear, a terrifying tale of totalitarian mentality set in the 1950s. Kachyňa’s film tells the story of a deputy minister and his wife who return home to discover that their house has been visited by the secret police in their absence. Shot very much in a film noir style, its journey into the atmosphere and state of mind of an era evokes a world of paranoia and fear. The world of Kafka has come to life, with inexplicable fates visited even on those at the centre of the system. What the year 1969 saw, rather perversely, was the completion of the production programme planned during the Prague Spring. When the cinema should have died, it flowered. Among the films produced between autumn 1968 and the end of 1969 were: Adelheid (František Vláčil), Birds, Orphans and Fools (Jakubisko), A Case for the Young Hangman (Pavel Juráček), Witchhammer (Otakar Vávra), The Ear, Skylarks on a String (Menzel), Adrift (Kadár), 322 (Dušan Hanák), Fruit of Paradise (Chytilová), Seventh Day, Eighth Night (Evald Schorm), and Funural Rites (Zdenek Sirový). Paradoxically, film achievement was both critically and aesthetically at the same level – perhaps higher – than in previous years. The real repression of cinema began in late 1970 and well over 100 feature films from the previous decade were banned during the next five years. Four of them – All My Good Countrymen, The Firemen’s Ball, together with Jan Němec’s allegorical tale of totalitarian power, The Party and the Guests (1966), and Evald Schorm’s comedy End of a Priest (1968), in which a fake priest engages in ideological discussions with the local Communist mayor – were to be banned ‘for ever’. Others were stopped in mid-production, and a further group of completed films could not be released. The dead hand of ‘normalisation’ descended on the country for the next 20 years. As the political scientist Milan ýimečka put it, it was a period in which the Communist Party was to become what it had been in the past – ‘united only by obedience and a readiness to fulfil its role as a trustworthy receiver of instructions and directives’. It was to become ‘an age of immobility’. Given the political changes and new economic realities, relatively few films from this late flowering reached international markets at the time and some – Kachyňa’s The Ear, Menzel’s Skylarks on a String, a stunning comedy adapted from Bohumil Hrabal, and Sirový’s Funeral Rites, an atmospheric journey into the corruption of the 1950s – only made their international debuts in 1990. Thus, Skylarks on a String had the distinction of winning the Golden Bear at the Berlin Festival 20 years after its completion. But filmmakers didn’t just follow the production programme of 1968, they also filmed the invasion itself. Much of the footage reaching Western media was smuggled out by Jan Němec and finally formed part of his film Oratorio for Prague (1968) – and was also used in Philip Kaufman’s later adaptation of Milan Kundera’s novel, The Unbearable Lightness of Being (1987). Another powerful assemblage was Evald Schorm’s silent film Confusion (1968, released 1990), put together in association with Jan ýankmajer’s current producer, Jaromí­r Kallista. One of the most interesting films of the time was The Uninvited Guest (1969), a student graduation film made by Vlastimil Venclík. His original story, written two years earlier, was about a couple who receive an uninvited guest – a great hulking man – who decides to stay with them permanently. After originally planning to murder him, they decide to put up with his presence. In the meantime, they discover that all their neighbours have similar guests. Venclík, in this case, does not deny that he intended it as an allegory on the invasion and on the country’s ‘accommodation’. The film was confiscated by state security, and Venclík was expelled and charged with sedition. He finally graduated in 1990 when his film could at last be shown. The extensive celebration of 1968 – All Power to the Imagination: 1968 and its Legacies – provides a rare opportunity to see some of these works. The season at the Barbican ‘Censorship as a Creative Force’ offers screenings of Skylarks on a String and Funeral Rites (both April 30) while, on May 6, at the Ciné Lumière there will be a screening of Confusion and a selection of contemporary newsreel coverage of the invasion. The evening will be completed by a revival of Leslie Woodhead’s seminal British documentary drama Invasion (1980), which he will introduce. Woodhead, who headed a special unit at Granada Television, specialised in using documentary drama to explore contemporary subjects inaccessible to conventional reporting (Three Days in Szczecin  among others). Invasion is based on the reminiscences of Zdeněk Mlynáõ (Night Frost in Prague, London, Hurst, 1980), a lawyer who played an important role in the drafting of the Dubček government’s reform programme. With performances by Julian Glover as Dubček and Ray McAnally as Josef Smrkovsky (President of the National Assembly), it’s a remarkable portrait of what went on behind closed doors as a nation’s government was held to ransom, and a penetrating insight into the ways in which Brezhnev and his government viewed the activities and traditions of the smaller countries that fell under its control. Peter Hames is the author of The Czechoslovak New Wave, published by Wallflower Press. We have a copy of the book together with a DVD of The Party and the Guests to give away in our May competition. To enter, just spin the Film Roulette!